Black/Red - Also available in other colors. One of the best boxing gloves on the market today. With the soft, broken-in feel, high-impact padding and ultimate wrist protection, the S3 has gained fame with pro fighters and amateurs alike for their comfort, durability, and overall feel. It includes high-tech multi-layered gel-infused foam interior, giving it one of the most comfortable hand slim-fit compartments in the industry. 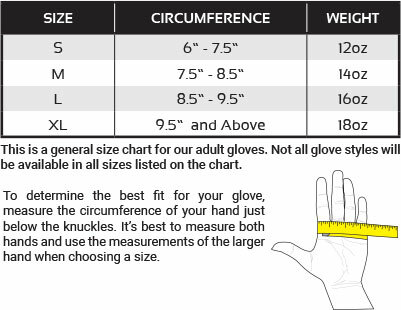 Stylish, premium, full cowhide leather glove perfectly blends the best elements of classic boxing glove design with modern innovations, solid wrist support and a perfect thumb position, making it a superior choice for Boxing, Kickboxing or MMA. Trusted by pro boxers and martial artists worldwide, these top-end gloves are ideal for both sparring and bag work, satisfying heavy hitters and beginners alike. Wear them once and you’ll be hooked! Whether you’re seeking the best gloves for boxing or Mauy Thai, you can always depend on Revgear for professional gear that gets the job done right. Browse our wide selection of other glove styles, including our Original Leather Boxing Gloves, Thai Style Boxing Gloves, and Elite Leather Boxing Gloves. After you are done training and want to get into the ring, click on Boxing Gloves to learn more about our gear! We’re known for our outstanding customer service. If you have any questions about our S3 Sparring Boxing Glove, please call our experts at 800-767-8288 or message us online. As the original California martial arts brand since 1996, we take our commitment to excellence very seriously. Our goal is to provide products that empower you to be the best athlete you can be. Place your order with full confidence today.